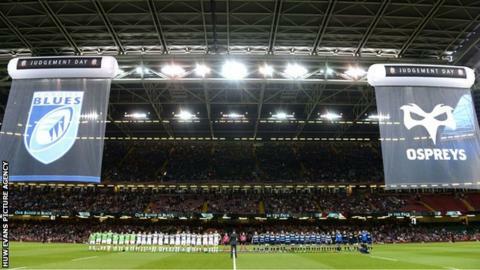 Welsh Rugby Union chief executive Roger Lewis says Judgement Day could become a domestic season curtain-raiser. The event, which sees the four Welsh regions play back-to-back derbies at Cardiff's Millennium Stadium, drew a record crowd of 52,760 on Saturday. It has been played in April for the past three years, but Lewis thinks it could move to the autumn. "I think it could be a great season opener in September some time in the future years," he said. "It was a great success and it was a triumph... it was our third Judgement Day and I think next year will be a sell-out. "It took some time, I first proposed it in 2007 and again in 2008, 2009, 2010, 11 and 12 and we finally did it in 2013. "It's great it's off the ground and I think this is something that could launch the regional season." The latest event saw Ospreys beat Cardiff Blues 31-23 and Scarlets triumph 29-10 over Dragons. It cannot be staged in September 2015 because of the Rugby World Cup. Lewis steps down from his post after that event. Wales' regions have recently rested international players at the start of the season, especially after summer tours. In 2016 Wales are scheduled to undertake a tour of New Zealand and in 2017 Wales will tour the Pacific Islands at the same time as the British and Irish Lions tour New Zealand. In 2017 Wales are going to Argentina in the summer. However, Lewis acknowledged that the April slot is proving popular with fans looking for a major rugby event late in the season. "This time of the year it's perfect for us as well when we have this opportunity post-Six Nations," he added.